Pittsburgh’s still standing with the victims of June’s Orlando shooting – by not standing still at all. On Friday, people danced with rainbow “#KeepDancingOrlando” signs as others strolled by or ate at nearby tables on their lunch break in Downtown Pittsburgh’s Market Square. 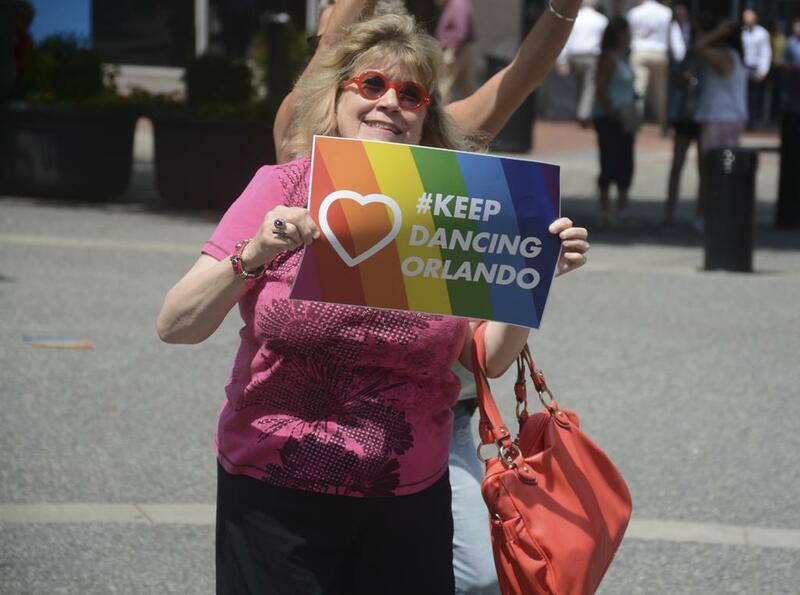 The Delta Foundation – a Western Pennsylvania LGBT organization – hosted the making of Pittsburgh’s “#KeepDancingOrlando” video from noon to 1 p.m. Josh Birt Media Productions filmed the event. Candi Castleberry Singleton, the founder of the Dignity and Respect campaign, emceed the filming and urged onlookers to join in. She spoke about other events that have happened since the Orlando mass shooting. “Differences are only barriers when we allow them to be,” Singleton said. During the early morning of July 5, Alton Sterling was killed during a police confrontation in Baton Rouge, Louisiana. On July 6, Philando Castile was killed during a traffic stop in St. Paul, Minnesota. Videos of both deaths went viral on social media throughout the week. On the night of July 7, an otherwise peaceful protest in downtown Dallas, Texas, turned violent when 25 year-old Micah Johnson shot police officers, killing five and injuring seven other officers. On Thursday night, 84 people were killed and more than 200 were injured after a truck drove through a crowd celebrating Bastille Day in Nice, France. Josh Sayles, director of the Jewish Federation of Greater Pittsburgh, came to show support.